A standard of excellence in personalized care enables us to provide the quality services our patients deserve. We provide comprehensive treatment planning and use the most effective combination of chiropractic care and massage therapy to work toward optimal health. Should a chiropractic emergency occur, we make every effort to see and care for you as soon as possible. As a practice, we are true believers that preventative care and education are the keys to optimal health. We strive to provide “proactive health care” vs. “disease care” by focusing on re-exams upon every visit and taking x-rays whenever necessary. We also know that routine maintenance care is essential to continuing to strive toward a healthier lifestyle. A review of your medical history can help us stay informed of your overall health, any new medications, and any illnesses that may impact your treatment plan. As health professionals, we want you to be confident knowing that we are a team of highly trained and skilled clinicians. We pride ourselves in providing the care you need to keep your body and mind healthy. Giving you the best possible service and results, we are committed to continual education and learning. We attend lectures, meetings, and conventions to stay informed of new techniques, the latest products, and reading materials to stay on top of your care. Also, being members of various professional associations helps us to stay abreast of the changes and recommendations for our profession. Building a foundation of trust by treating our patients as special individuals is vital to our success. We understand how uneasy some patients may feel about their chiropractic visits, and we remedy this by making a difference in providing a relaxing and positive experience. Our entire team is dedicated to providing you with excellent, personalized care and service to make your visits as comfortable and pleasant as possible. We proudly offer flexible and easy payment options, accept most insurance plans, and file the insurance claims on the patient’s behalf. We also are a proud accepter of Health Spending Accounts (HSAs). Make an appointment today and indulge in wellness! We thank you for allowing us to take care of your health needs and look forward to serving you. As a professional in the field of chiropractic, Dr. Johnson has had the distinct honor to treat many people from athletes both professional and amateur, to seniors, adults, young adults, teens, children, and infants. It is his duty, as well as his obligation, to provide the community with a service that is both valuable and necessary. 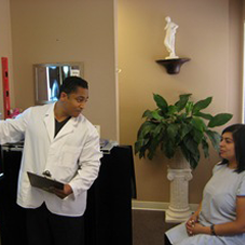 Dr. Johnson strives for change by promoting a healthy lifestyle for clients in his community. Like most students, Dr. Johnson completed his bachelor’s degree before entering into chiropractic school. Once accepted, the Doctorate Program of Chiropractic envoles 4 years of full time enrollment, which consists of a schedule of courses that must be taken. Some of the courses taken are: Embryology, Physiology, Microbiology, Anatomy, Neuro-anatomy, Endocrinology and many more.... prior to becoming a Licensed Chiropractor one must succefully complete the four-part state licensing exams. These licensing exams cover all of the courses studied throughout the chiropractic curriculum. These exams are a means of ensuring that all of the Chiropractic Colleges are teaching to a satisfactory level of proficiency. . If a candidate does not pass at least four of the six subjects, they must retake all six subjects; therefore, they must repeat that full part of the four-part series.